네트워크를 통한 실시간 통신은 초기 혼잡 조건 하에서 QoS(quality of sercive)를 향상시키기 위해 조정된다. Real time communications over a network are adjusted to improve the QoS (quality of sercive) under incipient congestion conditions. 시스템은 초기 네트워크 혼잡을 검출하여 초기 혼잡에 대한 정보를 송신기로 다시 피드백한다. The system detects the initial network congestion feedback information back to the incipient congestion back to the transmitter. 이 정보에 기초하여, 가중 파라미터, 이득 파라미터, 및 혼잡 레포트로부터의 정보에 따라 변경된 송신 레이트를 산출하는 제어 알고리즘을 적절히 이용함으로써 송신 레이트가 적절히 변경된다. By the basis of the information, appropriately using a control algorithm for calculating the transmission rate is changed according to the weight parameter, a gain parameter, and information from a congestion report the transmission rate is changed accordingly. 변경된 송신 레이트는 수신기에서 수용 가능한 QoS를 유지하도록 가용 대역폭에 대한 송신기의 사용을 개선시킨다. Altered transmission rate improves the transmitter's use of the available bandwidth to maintain an acceptable QoS at the receiver. 도 1은 본 발명의 실시예에 있어서 예시적인 엔드 투 엔드 시스템(end to end system)을 도시하는 도면. 1 is a diagram illustrating an exemplary end-to-end system (end to end system) according to an embodiment of the present invention. 도 2는 본 발명의 실시예에 있어서 예시적인 엔드 시스템을 도시하는 도면. Figure 2 is a diagram illustrating an exemplary end system in an embodiment of the present invention. 도 3은 본 발명의 실시예에 있어서 예시적인 중간 장치를 도시하는 도면. Figure 3 is a diagram illustrating an exemplary intermediary device in an embodiment of the present invention. 도 4는 본 발명의 실시예에 있어서 각종 장치들 사이의 메시징 및 동작들을 도시하는 도면. Figure 4 is a diagram illustrating the messaging and operations among various devices in an embodiment of the present invention. 도 5는 본 발명의 실시예에 있어서 데이터 스트리밍 환경의 리액티브 대역폭 제어에 대한 동작을 도시하는 도면. 5 is a view showing the operation for reactive bandwidth control of the data streaming environment in an embodiment of the present invention. 도 6은 본 발명의 실시예에 있어서 이득 파라미터를 설정하는 동작들을 도시하는 도면. 6 is a view illustrating the operation for setting a gain parameter in an embodiment of the present invention. 도 7은 본 발명의 실시예에 있어서 전송 레이트를 갱신하는 동작들을 도시하는 도면. Figure 7 is a view showing the operations for updating a transmission rate in an embodiment of the present invention. 도 8은 본 발명의 실시예를 구현하기 위해 사용되는 예시적인 시스템을 도시하는 도면. 8 is a diagram illustrating an exemplary system used to implement an embodiment of the present invention. 본 발명은 일반적으로 네트워크 통신에 관한 것으로, 특히 네트워크 통신시 대역폭 사용의 제어에 관한 것이다. The present invention relates generally to network communications, and more particularly to a control at the time of communication network bandwidth. 스트리밍 비디오 및 오디오 플레이어 등의 많은 최근의 멀티미디어 어플리케이션들은 원래 부착형 로컬 저장 장치(예를 들면 CD 또는 하드 디스크)로부터 또는 고품질의 낮은 레이턴시 네트워크(예를 들면, 경미하게 부하가 걸린 근거리 통신망 즉 LAN)를 통해 동작하도록 고안되었다. Streaming video, and many recent multimedia applications originally attached local storage (e.g., CD or hard disk) or from a high-quality low latency network (e.g., slightly more local area network is under load that is LAN) such as an audio player the was designed to work through. 그러나, WAN 등의 보다 낮은 품질의 네트워크를 통해 실행되는 경우, 네트워크 혼잡으로부터 발생하는 패킷 소실 및 레이턴시는 종종 열악한 QoS(Quality of Service)로 설명되는 열악한 사용자 경험을 제공할만큼 충분히 멀티미디어 어플리케이션의 실시간 동작을 종종 손상시킨다. However, when running through the low quality of the network rather than the WAN, such as packet resulting from network congestion loss and latency are often poor QoS (Quality of Service) real-time operation of a fully multimedia applications as providing a poor user experience, as described in the causes are often damaged. 예를 들면, 비디오 프레임이 소실될 수 있고, 또는 비디오 및 오디오 동기화가 변질될 수 있어, 멀티미디어 성능의 질이 저하된다. For example, a video frame may be lost, or video and audio synchronization it may be altered, the quality of the multimedia performance is lowered. 이 문제를 처리하기 위해, 몇몇 현재의 멀티미디어 어플리케이션은 네트워크 조건에 따라 그 전송 레이트를 바꾸도록 개발되었다. To address this problem, some of the current multimedia applications have been developed to change the transfer rate depending on network conditions. 하나의 접근법은 소실된 패킷의 검출에 응답하여 전송 레이트를 변경한다. One approach is to change the transmission rate in response to the detection of the missing packets. 특히, 스트리밍 멀티미디어와 같은 실시간 어플리케이션에 대해서는, RTP(Real Time Protocol)가 QoS를 모니터하고 소실된 패킷 검출에 기초하여 참가 정보를 전송하기 위해 관련 RTCP(Real Time Control Protocol)로 특정된다. In particular, for real-time applications such as streaming multimedia, the RTP (Real Time Protocol) is specific to the relevant RTCP (Real Time Control Protocol) to transmit information, participation based on the detected monitor the QoS and packet loss. 다른 접근법은 데이터 소실을 피하거나 최소화하기 위해 네트워킹 장치에서 버퍼링되는 패킷의 수를 증가시킨다. Another approach increases the number of packets that are buffered in networking equipment in order to avoid or minimize data loss. 이들 향상된 버퍼링 방식에는 포워드 에러 정정도 사용될 수 있다. These enhanced buffering scheme, forward error correction can also be used. 또 다른 접근법은 "보틀넥(bottlenect)" 링크의 예상된 대역폭을 추정하고 이에 따라 전송 레이트를 통계적으로 설정하고자 한다. Another approach estimates the expected bandwidth of the "bottle-neck (bottlenect)" link, and to statistically set the transmission rate accordingly. 그러나, 이들 현존하는 접근법들은 불충분하다, 제1 접근법은 소실된 패킷의 검출에 달려 있기 때문에, 문제를 해결하기 위한 시도는 사용자가 초기의 패킷 소실을 경험하지 않도록 방지하기에 너무 늦다. However, these existing approaches which are inadequate, the first approach because it depends on the detection of the lost packet, an attempt to solve the problems is too late to prevent the user from experiencing the initial packet loss. 버퍼링을 증가시키는 제2 접근법은 데이터 소실을 많은 송신 큐에 의해 도입되는 증가된 레이턴시로 대체한다. The second approach of increasing buffering replaces data loss with increased latency introduced by large send queues. 또한, 제2 접근법은 시청각 이동 전화 또는 시계 등의 제한된 버퍼 메모리를 갖는 장치에 대해 문제가 된다. In addition, the second approach is problematic for devices having limited buffer memory, such as audio-visual mobile phone or watch. 제3 접근법은 보틀넥에서 가용 대역폭을 공유하는 다수의 어플리케이션에 의해 도입된 동적 혼잡의 변화 또는 본래의 가변 대역폭 보틀넥(예를 들면 무선 링크)을 처리하지 못한다. The third approach is changed or the original of the variable bandwidth of a dynamic congestion introduced by multiple applications sharing the available bandwidth at the bottleneck bottlenecks (for example a radio link) can not handle. 또한, 현존하는 접근법은 특히 멀티미디오 어플리케이션에서 흔하게 사용되고 있는 실시간 통신에 대한 초기 혼잡에 응답하는 리액티브 대역폭 제어를 처리하 지 못한다. In addition, the existing approach does not handle the reactive bandwidth control, responsive to incipient congestion for real-time communication that is used commonly in the particular multimedia application o. 본 발명의 실시예들은 탄력적인 지연 감지형 멀티미디어(elastic - delay - sensitive - multimedia)에 적합한 피드백을 사용하여 가용 네트워크 대역폭의 가중된 페어 공유(fair-share)를 트래킹함으로써 상기 문제를 해결한다. Embodiments of the present invention are resilient, delay-sensitive multimedia using a suitable feedback to the (elastic - delay - - sensitive multimedia) solves the above problems by tracking a weighted fair share (fair-share) of the available network bandwidth. 시스템은 초기 네트워크 혼잡을 검출하고, 정보를 송신기로 피드백함으로써 송신기가 네트워크에서 초기 혼잡에 적응가능하도록 한다. System by feeding back the detection information to the initial network congestion, and to the transmitter to enable the transmitter to adapt to incipient congestion in the network. 초기 혼잡은 아직 발생되지 않은(예를 들면 아직 패킷이 소실되거나 또는 레이턴시가 수용 불가능하게 되지 않은) 혼잡에 관한 것이다. Incipient congestion is related to that have not yet occurred (e.g., has not yet been to a packet loss or latency is not acceptable) the congestion. 이 정보에 기초하여 송신 레이트가 적절하게 변경된다. The transmission rate is appropriately changed based on the information. 제어 알고리즘은 가중 파라미터, 이득 파라미터, 및 혼잡 레포트로부터의 정보에 기초하여 변경된 송신 레이트를 산출한다. Control algorithm, and calculates the transmission rate is changed based on information from the weight parameter, a gain parameter, and a congestion report. 변경된 송신 레이트는 수신기에서 수용 가능한 QoS를 유지하도록 가용 대역폭에 대한 송신기의 사용을 개선시킨다. Altered transmission rate improves the transmitter's use of the available bandwidth to maintain an acceptable QoS at the receiver. 본 발명의 구현시, 제조물은 컴퓨터 프로그램 제품으로서 제공된다. The implementation of the invention, the article of manufacture are provided as computer program products. 컴퓨터 프로그램 제품의 일 실시예는 컴퓨터 시스템에 의해 판독가능한 컴퓨터 프로그램 저장 매체를 제공하며, 중간 장치에 의해 검출된 초기 리소스 혼잡의 표시에 기초하여 리소스 소비자에 의한 가용 리소스에 대한 리소스 요구를 조정하는 컴퓨터 프로그램을 인코딩한다. One embodiment of a computer program product is a computer that provides a readable computer program storage medium, based on the indication of incipient resource congestion detected by an intermediary device to adjust a resource demand on an available resource by a resource consumer by a computer system to encode the program. 컴퓨터 프로그램 제품의 또 다른 실시예는 컴퓨팅 시스템에 의해 캐리어 웨이브로 구현되는 컴퓨터 데이터 신호에 제공될 수 있으며, 중간 장치에 의해 검출된 초기 리소스 혼잡의 표시에 기초하여 리소스 소비자에 의한 가용 리소스에 대한 리소스 요구를 조정하는 컴퓨터 프로그램을 인코딩한다. Resources for another embodiment of a computer program product, for example, is usable by the resource consumer based on an indication of the incipient resource congestion detected by an intermediary device number, and be provided in computer data signal embodied in a carrier wave by a computing system resources and encoding a computer program for adjusting the requirements. 컴퓨터 프로그램 제품은 중간 장치에 의해 검출된 초기 리소스 혼잡의 표시에 기초하여 리소스 소비자에 의한 가용 리소스에 대한 리소스 요구를 조정하는 컴퓨터 프로세스를, 컴퓨터 시스템 상에서 실행하기 위해 컴퓨터 프로그램을 인코딩한다. The computer program product encodes a computer program for executing a computer process for adjusting a resource demand on an available resource by a resource consumer based on an indication of incipient resource congestion detected by an intermediary device, on a computer system. 리소스 소비자와 관련된 가용 리소스의 페어 공유에 관한 가중 파라미터가 결정된다. The weighting parameters on the fair sharing of the available resources associated with resource consumer is determined. 초기 리소스 혼잡의 표시가 수신된다. The indication of incipient resource congestion is received. 초기 리소스 혼잡의 표시에 기초하여, 중간 장치를 통해 리소스 소비자에 의한 리소스 요구시 조정의 크기에 대한 이득 파라미터가 결정된다. Based on the indication of incipient resource congestion, it is through the intermediate apparatus determines the gain parameter for the size of the adjustment when resource demand by the resource consumer. 리소스 소비자에 의한 가용 리소스의 사용을 조정하기 위해 가중 파라미터 및 이득 파라미터에 기초하여 새로운 리소스 요구가 산출된다. A new resource demand is calculated based on the weight parameter and the gain parameter to adjust use by the resource consumer of the available resource. 또 다른 실시예에서, 중간 장치에 의해 검출된 초기 리소스 혼잡의 표시에 기초하여 리소스 소비자에 의한 가용 리소스에 대한 리소스 요구를 조정하는 방법이 제공된다. In a further embodiment, this on the basis of the indication of incipient resource congestion detected by an intermediary device, a method of adjusting a resource demand on an available resource by a resource consumer is provided. 리소스 소비자와 관련된 가용 리소스의 페어 공유에 관한 가중 파라미터가 결정된다. The weighting parameters on the fair sharing of the available resources associated with resource consumer is determined. 초기 리소스 혼잡의 표시가 수신된다. The indication of incipient resource congestion is received. 초기 리소스 혼잡의 표시에 기초하여, 중간 장치를 통해 리소스 소비자에 의한 리소스 요구시 조정의 크기에 대한 이득 파라미터가 결정된다. Based on the indication of incipient resource congestion, it is through the intermediate apparatus determines the gain parameter for the size of the adjustment when resource demand by the resource consumer. 리소스 소비자에 의한 가용 리소스의 사용을 조정하기 위해 가중 파라미터 및 이득 파라미터에 기초하여 새로운 리소스 요구가 산출된다. A new resource demand is calculated based on the weight parameter and the gain parameter to adjust use by the resource consumer of the available resource. 또 다른 실시예에서, 하나의 방법은 초기 리소스 혼잡의 표시를 네트워크의 송신기에 제공한다. In yet another embodiment, a method provides an indication of incipient resource congestion to a transmitter in the network. 초기 리소스 혼잡의 표시는 네트워크의 중간 장치에 의해 제공된 ECN(Explicit Congestion Notification) 마킹 정보에 기초한다. Indication of incipient resource congestion is based on (Explicit Congestion Notification) ECN marking information provided by an intermediary device in the network. 중간장치로 부터 수신된 ECN 마킹 정보는 트래킹된다. Received from the intermediate apparatus ECN marking information is tracking. 트래킹 동작에 응답하여, 초기 리소스 혼잡을 나타내는 혼잡 레포트를 생성하도록 ECN 마킹 정보가 디코딩된다. In response to the tracking operation, the ECN marking information is decoded to generate a congestion report indicating incipient resource congestion. 혼잡 레포트는 송신기에 전달된다. Congestion report is communicated to the transmitter. 또 다른 컴퓨터 프로그램 제품 실시예는 초기 리소스 혼잡의 표시를 네트워크의 송신기에 제공한다. Another embodiment example is a computer program product provides an indication of incipient resource congestion to a transmitter in the network. 초기 리소스 혼잡의 표시는 네트워크의 중간 장치에 의해 제공된 ECN 마킹 정보에 기초한다. Indication of incipient resource congestion is based on ECN marking information provided by an intermediary device in the network. 중간장치로부터 수신된 ECN 마킹 정보는 트래킹된다. The ECN marking information received from the intermediary device is tracked. 트래킹 동작에 응답하여, 초기 리소스 혼잡을 나타내는 혼잡 레포트를 생성하도록 ECN 마킹 정보가 디코딩된다. In response to the tracking operation, the ECN marking information is decoded to generate a congestion report indicating incipient resource congestion. 혼잡 레포트는 송신기에 전달된다. Congestion report is communicated to the transmitter. 또 다른 실시예에서, 엔드 시스템은 중간 장치에 의해 검출된 초기 리소스 혼잡의 표시에 기초하여 리소스 소비자에 의한 가용 리소스에 대한 리소스 요구를 조정하기 위해 리액티브 대역폭 제어를 제공한다. In yet another embodiment, an end system provides reactive bandwidth control to based on the indication of incipient resource congestion detected by an intermediary device to adjust a resource demand on an available resource by a resource consumer. 네트워크 전송층 모듈은 초기 리소스 혼잡의 표시를 수신한다. A network transport layer module receives the indication of incipient resource congestion. WTP 모듈은 리소스 소비자와 관련된 가용 리소스의 페어 공유에 관한 가중 파라미터를 결정한다. WTP module determines a weighting parameter associated with the fair share of the available resources associated with the resource consumer. WTP 모듈은 또한 초기 리소스 혼잡의 표시에 기초하여, 중간 장치를 통해 리소스 소비자에 의한 리소스 요구시 조정의 크기에 관한 이득 파라미터를 결정한다. The WTP module also determines a gain parameter relating to the size of the adjustment when resource demand by the resource consumer based on the indication of incipient resource congestion, via the intermediate apparatus. 또한, WTP 모듈은 리소스 소비자에 의한 가용 리소스의 사용을 조정하기 위해 가중 파라미터 및 이득 파라미터에 기초하여 새로운 리소스 요구를 산출한다. Furthermore, WTP module to adjust the use of the available resource by a resource consumer based on the weight parameter and the gain parameter to calculate a new resource demand. 또 다른 실시예에서, 엔드 시스템은 초기 리소스 혼잡의 표시를 네트워크의 송신기에 제공한다. In yet another embodiment, an end system provides an indication of incipient resource congestion to a transmitter in the network. 초기 리소스 혼잡의 표시는 네트워크의 중간 장치에 의해 제공된 ECN 마킹 정보에 기초한다. Indication of incipient resource congestion is based on ECN marking information provided by an intermediary device in the network. 마크 피드백 코덱은 초기 리소스 혼잡을 나타내 는 혼잡 레포트를 생성하도록 ECN 마킹 정보를 디코딩한다. Mark feedback codec decodes the ECN marking information to generate a congestion report represents the incipient resource congestion. 마크 트래킹 모듈은 중간장치로부터 수신된 ECN 마킹 정보를 트래킹하여 ECN 마킹 정보를 마크 피드백 코덱으로 보낸다. Mark tracking module tracking the ECN marking information received from the intermediary device sends the ECN marking information to the mark feedback codec. 본 발명을 특징지우는 상기 및 각종 다른 특징 뿐만 아니라 다른 이점들은 다음의 상세한 설명 및 관련된 도면 설명을 이해함으로써 명백하게 될 것이다. As well as the various other features and clear the present invention features other advantages will become apparent by understanding the following detailed description and the associated drawings describe. 네트워크를 통한 실시간 통신은 초기 혼잡 조건 하에서 QoS를 개선하도록 조정된다. Real time communications over a network are adjusted to improve the QoS under incipient congestion conditions. 시스템은 초기 네트워크 혼잡을 검출하고 초기 혼잡에 관한 정보를 송신기로 다시 피드백한다. System detects the initial network congestion, and again feedback information regarding the incipient congestion back to the transmitter. 이 정보에 기초하여, 송신 레이트는 가중 파라미터, 이득 파라미터, 및 혼잡 레포트로부터의 정보에 기초하여 변경된 송신 레이트를 산출하는, 제어 알고리즘을 적절히 사용하여 변경된다. Based on this information, the transmission rate is altered appropriately using a control algorithm for calculating the transmission rate is changed based on information from the weight parameter, a gain parameter, and a congestion report. 변경된 송신 레이트는 송신기의 가용 대역폭에 대한 사용을 개선하여 수신기에서 수용가능한 QoS를 유지한다. The changed transmission rate is improved by the use of the available bandwidth of the transmitter to maintain an acceptable QoS at the receiver. 리액티브 대역폭 제어는, 무선 네트워트의 송신 전력의 제어, 분산 컴퓨팅 어플리케이션에서의 프로세싱 요구의 조정, 및 저장 어프리케이션에서의 저장 요구의 조정을 포함하지만 이에 제한되지 않는 다양한 구성에 적용될 수 있음을 이해해야 한다. Reactive bandwidth control is to be understood that, including the adjustment of the storage needs of the adjustment of the processing request from the radio network controller in the transmit power of the network, the distributed computing application, and the storage eopeu application but may be applied to a variety of configurations not limited to, . 일반적으로, 포괄적인 리소스 사용은 초기 리소스 혼잡(예를 들면 과부하) 표시에 응답하여 제어될 수 있다. In general, comprehensive resource usage may be controlled in response to incipient resource congestion (e.g., overload) display. 많은 네트워크 통신은 "실시간" 또는 "비실시간" 통신으로서 범주화될 수 있다. Many network communications may be categorized as a "real-time" or "non-real-time" communications. 예를 들면, HTML(HyperText Markup Language) 문서를 포함하는 HTTP(HyperText Transfer Protocol) 응답과 같은 파일 전송은 비실시간 통신으로 생각될 수 있다. For example, a file transfer, such as HTTP (HyperText Transfer Protocol) response containing (HyperText Markup Language) HTML document can be thought of as a non-real-time communication. 많은 비실시간 어플리케이션에서, TCP(Transmission Control Protocol) 는 통신의 제어에 적합하다. Many non-real-time applications, (Transmission Control Protocol) TCP is suitable for the control of communication. TCP는 가장 흔한 전송층 프로토콜이며 그 기반 프로토콜로서 IP(Internet Protocol)에 기초하고 있다. TCP is the most common transport layer protocol is based on IP (Internet Protocol) as its underlying protocol. 이러한 것으로서, TCP/IP는 "인터넷 프로토콜 기반의 전송 제어 프로토콜(Transmission Control Protocol over Internet Protocol)"을 의미한다. As such, TCP / IP means "Transmission Control Protocol Internet Protocol-based (Transmission Control Protocol over Internet Protocol)". TCP는 접속 지향형이고 IP 패킷 스위치형 네트워크를 통해 신뢰성있는 통신을 제공한다. TCP is oriented and provides reliable communications over IP packet-switched network connection. 네트워크 혼잡 또는 다른 통신 이벤트에 의해 패킷이 소실되면, TCP는 패킷 소실에 대한 정보를 검출 및 피드백하기 위한 알고리즘을 지정하여 송신기가 소실된 패킷을 의도된 수신기로 재송신할 수 있게 한다. If the packet is lost by network congestion or other communication events, TCP is able to re-transmission to the receiver specified by an algorithm intended packets the transmitter has been lost for detecting and feeding back information about the packet loss. 이러한 방식으로, TCP는 송신기와 수신기 사이의 100% 신뢰성있는 통신을 목표로 하며, 이는 파일 전송 어플리케이션에 결정적이다(예를 들면 소실된 패킷을 전달하지 못하면 변질된 파일이 수신됨). In this way, TCP, and is aimed at 100% reliable communications between a transmitter and a receiver, which is crucial to file transfer applications (e.g., a search is altered files received does not pass the packet loss g). 그러나, 많은 멀티미디어 어플리케이션은 실시간 스트리밍 미디어 어프리케이션이며, 적절한 데이터 패킷의 수신이 수용가능한 어플리케이션의 동작에 결정적이다. However, many multimedia applications are real-time streaming media applications eopeu, is crucial to the operation of the acceptable application receives the appropriate data packets. 또한, 100 % 신뢰도는 필요없다. In addition, the reliability is not 100% necessary. 일반적으로 패킷의 늦은 도착 또는 재전송에 앞서 멀티미디어 어플리케이션을 지연시키는 것보다, 송신되거나 또는 실제로 지연된 패킷을 잃어버리는 것이 바람직하다. Than that typically delay the advance of the late arrival of multimedia applications or retransmission of packets, it is desirable to transmit or discard actually delayed lost packets. 예를 들면, 비디오 스트림의 패킷이 전송시 소실되거나 또는 매우 지연되면, 수신기가 궁극적으로 잘못된 패킷을 수신할 수 있도록 비디오 데이터를 계속 플레이하는 것보다는 이어지는 데이터를 계속 스트리밍하는 것이 더 중요하다. For example, if the packet loss during transmission of the video stream, or very delayed, it is more important that the receiver is still streaming the data, rather than leading to ultimately play the video data so that it can receive a malformed packet. 이러한 것으로서, 많은 실시간 네트워크 통신은 UDP(User Datagram Protocol)에 의존한다. As such, many real-time network communications rely on the UDP (User Datagram Protocol). UDP는 인터넷 네트워크층, 전송층, 및 세션층에 대한 통신 프로토콜이다. UDP is a communications protocol for the Internet network layer, transport layer, and session layer. TCP와 같이, UDP는 IP와 함께 사용된다. Such as TCP, UDP is used with IP. 그러나, TCP와 달리, UDP는 접속되지 않으며 신뢰성있는 통신을 보장하지 않는다. However, not unlike TCP, UDP is not connected to ensure reliable communication. 수신 어플리케이션은 필요하다면 임의의 에러를 처리하거나 신뢰성 있는 전송을 위해 검사를 하게 된다. Receiving the application is the test for transmission in process or reliability of any error, if necessary. 도 1은 본 발명의 실시예에 있어서 예시적인 엔트 투 엔트 시스템 도면을 나타낸다. 1 illustrates an exemplary ent-to-end system diagram according to an embodiment of the present invention. WAN(100)이 도시되지만, 본 발명의 실시예들은 LAN을 포함하는 다른 네트워크 타입에도 적용가능하다. But the WAN (100) are shown, embodiments of the present invention is also applicable to other network types, including LAN. WAN에서는, 대역폭 이용이 일반적으로 네트워크 백본(backbone)으로 갈수록 감소하며 혼잡은 거의 드물거나 없다. In the WAN, bandwidth use is generally decreasing as the network backbone (backbone) and congestion are not or hardly rare. 일반적으로 링크의 한쪽과 다른쪽 사이에 중요한 대역폭 불균등(disparity)이 존재하는 보틀넥(bottlenecks)이 가장 흔하게 발견된다. Typically it bottlenecks (bottlenecks) that significant bandwidth uneven (disparity) between the one and the other side of the link exists is found most frequently. 이 불균등에 의해 일반적으로 하부 대역폭 링크가 과부하된 경우 패킷 큐잉(queuing)이 과도하게 된다. In general, if a lower bandwidth link is overloaded by the uneven packet is queued (queuing) the transient. 따라서, 보틀넷은 액세스 링크(예를 들면, LAN이 비교적 혼잡하지 않은 네트워크 세그먼트 또는 백본에 접속하는 WAN의 한 점)에 빈번히 존재한다. Thus, the bottle net exists frequently the access link (e.g., a point in the WAN to access the network segment or backbone LAN are not comparatively crowded). 예를 들면, DSL(Digital Subscriber Line) 접속 또는 공동 인트라넷으로의 소규모 공유 회선이 전형적인 보틀넥이다. For example, a small share of the line in the connecting or joint intranet, DSL (Digital Subscriber Line) is a typical bottlenecks. 제1 엔드 시스템(101)은 네트워크(100)에 결합되며, 이는 카메라(104)로부터 서브젝트(108)의 비디오 데이터를 수신한다. A first end system 101 is coupled to network 100, which receives the video data of the subject 108 from a camera 104. The 디스플레이(112)는 엔드 시스템(102)으로부터 수신된 비디오 데이터 스트림으로부터 서브젝트(110)을 표시한다. Display 112 displays a subject 110 from a video data stream received from the end system (102). 제2 엔드 시스템(102)은 네트워크(100)에 결합되며, 이는 카메라(106)로부터 서브젝트(110)의 비디오 데이터를 수신한다. The second end system 102 is coupled to a network 100, which receives the video data of the subject 110 from a camera 106. The 디스플레이(114)는 엔드 시스템(101)으로부터 수신된 비디오 데이터 스트림으로부터 서브젝트(108)를 표시한다. Display 114 displays a subject 108 from a video data stream received from the end system (101). 예시적인 엔드 시스템은 범용 컴퓨터 또는 핸드 헬드 장치일 수 있지만, 본 발명의 범위 내에서 통신 키오스크, 이동 전화기, 및 다른 특정 목적의 장치를 포함하는 다른 엔드 시스템이 고려된다. But an exemplary end system general purpose computer or a hand held device, the other-end system including a communication kiosks, mobile phones, and other devices for a specific purpose within the scope of the invention is contemplated. 또한, 네트워크(100)는 2 이상의 엔드 시스템을 함께 통신 링크할 수 있고, 다수의 송신용 엔드 시스템(transmitting end system) 및 수신용 엔드 시스템(receiving end system)은 주어진 통신 세션에 결합될 수 있다. Further, network 100 may be the communication link with two or more end systems, a number of transmitter (transmitting end system) receiving end system and a number (receiving end system) receiving end system may be coupled to a given communication session. 이어지는 설명 부분은 수신용 엔드 시스템(102) 상에 서브젝트(108)를 디스플레이하기 위해 송신용 엔드 시스템(101)으로부터 나오는 비디오 데이터 스트림에 초점을 맞추고 있다. The following description focuses on the part of the video data stream coming from the transmitting end system 101 to be on the receiving end system 102 to display the subject (108). 그러나, 반대의 비디오 데이터 스트림은 엔드 시스템(102)로부터 나와서 엔드 시스템(101) 상에 서브젝트(110)를 디스플레이하며, 이는 본 발명에 따라 제어될 수 있음을 이해해야 한다. However, the video data stream of the opposite, and display the subject 110 on the end system 101 come out from an end system 102, it should be understood that this can be controlled in accordance with the present invention. 또한, 대응하는 오디오 데이터 스트림은, 본 발명에 따라 제어될 수 있으며, 비디오 데이터 스트림에 대한 대응부로서 엔드 시스템들 사이에서 전달될 수 있다. In addition, the corresponding audio data stream, which may be controlled in accordance with the present invention, as a corresponding portion of the video data stream can be transmitted between end systems. 2개의 엔드 시스템(101 및 102) 사이의 네트워크(100) 상에서, 적어도 하나의 라우터(116)가 초기 네트워크 혼잡을 검출하도록 동작한다. 2 operates in the at least one router 116 in the network 100 between the two end systems 101 and 102 to detect the initial network congestion. 라우터(116)는 도시된 실시예에서 혼잡을 검출하는 예시적인 중간 네트워크 장치이다. The router 116 is an exemplary intermediary network device that detects congestion in the illustrated embodiment. 다른 예시적인 중간 네트워크 장치는 게이트웨이, 방화벽, 및 프록시 서버를 포함할 수 있지만, 이에 제한되지 않는다. Other exemplary intermediary network devices may include a gateway, a firewall, a proxy server and is not limited thereto. 라인(118)과 같은 부분적인 라인들은 라우터(116)도 다른 네트워크 장치를 포함하는 다른 통신 흐름으로부터 데이터를 송수신할 수 있음을 나타낸다. Partial lines, such as line 118, indicate that the router 116 can send and receive data from other communication flows, including other network devices. 모든 이러한 통신 흐름은 라우터(116)가 경험하는 혼잡에 영향을 줄 수 있다. All such communication flows may have an impact on congestion to the router 116 experience. 도시된 실시예에서, 라우터(116)는 ECN(Explicit Congestion Notification) 마킹을 지원하며, ECT(ECN Capable Transport) 데이터 흐름에 대한 패킷을 마킹한다. In the illustrated embodiment, the router 116 supports (Explicit Congestion Notification) ECN marking and marks packets for the (ECN Capable Transport) ECT data flow. 몇몇 실시예에서, ECT 데이터 흐름은 퍼 IP 흐름(per IP flow)에 기초하여 지정된다. In some embodiments, ECT data flows are designated on the basis of the IP flow buffer (per IP flow). 따라서, 엔드 시스템(101)과 엔드 시스템(102) 사이의 ECT 데이터 흐름을 식별하기 위해, 엔드 시스템(101)과 같은 송신용 엔드 시스템과 엔드 시스템(102)과 같은 수신용 엔드 시스템 사이에는 통지 프로토콜이 존재한다. Therefore, between the end system 101 and end system 102 to identify ECT data flows between the same number as that of the transmitting end system and the end system 102, such as end system 101 receiving end system, the notification protocol this exists. 송신용 엔드 시스템(101)은 그 송신 동작이 네트워크의 가용 대역폭(즉, 리소스)을 소비하기 때문에 "리소스 소비자(resource consumer)"라고 칭해질 수 있다. The transmitting end system 101 may be referred to as "resource consumer (resource consumer)" because it consumes that transmission operation available bandwidth of the network (i.e., resources). 멀티미디어 스트림의 송신기로서의 그 수용력에 있어서, 송신용 엔드 시스템(101)은 그것이 ECT 장치임을 표시함으로써 초기 혼잡에 반응할 수 있음을 알린다. In its capacity as a transmitter of a multimedia stream, the transmitting end system 101 announces that it can react to incipient congestion by indicating that it is ECT device. 응답에서, 수신용 엔드 시스템(102)은 그것도 ECT 장치임을 알린다. In response, the receiving end system 102 announces that it ECT devices. 이와 같이 함으로써, 수신용 엔드 시스템(102)은 인입 비디오 데이터 스트리밍으로부터 검출하는 ECN 정보를 피드백하는데 동의한다. By doing this, the receiving end system 102 agrees to feedback ECN information that detects from the incoming video data stream. 이 동의에 의해 엔드 시스템은 비디오 데이터 스트리밍의 리액티브 대역폭 제어를 수용할 수 있다. 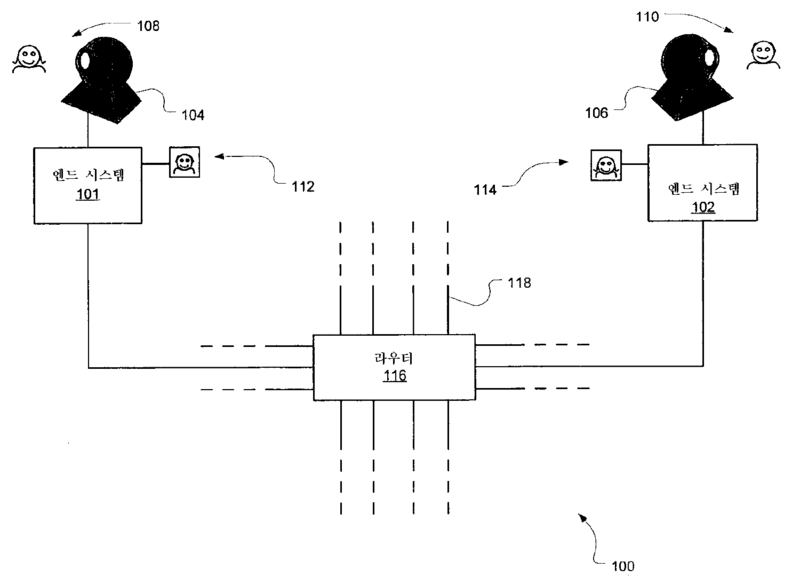 By the end system may agree to accommodate reactive bandwidth control of the video data stream. 그 후, 송신용 엔드 시스템(101)은 ECT 플래그를 세션의 모든 인출 IP 패킷 상에 설정하고, 라우터(116)가 ECT 데이터 흐름에 대한 패킷을 마킹할 수 있음을 라우터(116)에게 알린다. Then, the transmitting end system 101 sets an ECT flag on all drawn out IP packet of the session, and notifies the router 116 that the router 116 may mark packets for the ECT data flow. 다른 실시예에서, 송신용 엔드 시스템(101)으로부터의 모든 ECN 송신은 ECT로서 마킹된다. In other embodiments, all ECN transmissions from the transmitting receiving end system 101 are marked as ECT. 이 실시예에서, 송신용 엔드 시스템(101)은 수신된 임의의 혼잡 레포트에 반응할 수 있다. In this embodiment, the transmitting end system 101 can react to the received random congestion report. 혼잡 레포트가 전혀 수신되지 않으면, 송신용 엔드 시 스템(101)은 그 부재가 혼잡의 결여 또는 ECT 수신기의 결여에 의한 것인지를 식별할 필요가 없다. If the congestion report is not received at all, the transmitting end system 101 need not identify whether the member is caused by a lack or absence of ECT receivers of congestion. 송신기의 부분에서는 거동의 변화가 요구되지 않는다. In the part of the transmitter it is not a change of the behavior request. 1. 송신용 엔드 시스템(101)은 전송이 ECN 가능하지 않음을 나타내기 위해 ECN 비트를 (00)으로 설정한다. 1. sending and receiving end system 101 sets the ECN bits to (00) to indicate that the transfer is not possible ECN. b. b. 유사 랜덤 알고리즘을 호출함으로써 (1,0)과 (0,1) 사이에서 무작위적으로 선택하여 불가능(non-capability)을 생성. By calling a pseudo random algorithm selected randomly between (1,0) and (0,1) to generate a possible (non-capability). 3. 라우터(116)는 초기 혼잡의 검출을 표시하기 위해 ECN 비트를 (11)로 설정한다. 3. The router 116 sets the ECN bits to (11) to indicate the detection of incipient congestion. 라우터(116)가 혼잡 표시 임계값을 위반하면, 라우터(116)는 초기 네트워크 혼잡을 검출한 것으로 간주된다. When the router 116 violates the congestion indication threshold, the router 116 is deemed to have detected the initial network congestion. 이 CE 조건이 존재하면, 라우터(116)는 IP 패킷을 "마킹"하여 그 목적지를 향하여 각 패킷을 포워딩하기 전에 CE 조건을 표시한다. If the CE condition exists, the router 116 may display the CE condition before forwarding each packet on toward its destination by "marking" the IP packet. 예시적인 ECN 가능 라우터는 Cisco IOS 릴리즈 12.2.8(4) 또는 그 이상을 포함한다. The exemplary ECN capable router includes Cisco IOS release 12.2.8 (4) or more. 검출 및 마킹의 구현은 RED(Random Early Detection)와 같은 각종 AQM(Active Queue Mamagement), 또는 가상 큐(Virtual Queue)를 포함하지만 제한되지 않는 각종 기술을 포함할 수 있다. Implementation of detection and marking may include various AQM (Active Queue Mamagement), or a virtual queue (Virtual Queue), such as (Random Early Detection) RED, but includes a variety of techniques not limited. 마킹된 패킷을 수신하는 경우, 수신용 엔드 시스템(102)은 송신용 엔드 시스템(101)에 주기적으로 피드백을 송신하여 혼잡 마크가 수신되었음을 표시한다. When receiving marked packets, the number of credits-end system 102 indicating that the congestion mark is received, sending a feedback periodically to the transmitting end system 101. 이 피드백(예를 들면, 혼잡 레포트)에 기초하여, 송신용 엔드 시스템(101)은 라우터(116)에서의 대역폭 사용을 보다 최적화하기 위해 그 송신 레이트를 (위 또는 아래로) 변경한다. A feedback based on (e.g., a congestion report), the transmitting end system 101 alters its transmission rate (up or down) in order to better optimize the bandwidth usage at the router (116). 이 변경의 하나의 목적은 라우터(116)에서 네트워크 혼잡에 의해 야기되는 패킷 소실이 최소로 되거나 없도록 하는 최고 송신 레이트를 찾는 것이다. One purpose of this change is to find the highest transmission rate to prevent packet loss to a minimum, or which is caused by network congestion at the router (116). 도 2는 본 발명의 실시예에 있어서 예시적인 엔드 시스템을 도시한다. Figure 2 illustrates an exemplary end system in an embodiment of the present invention. 엔드 시스템(200)은 네트워크(220)를 통해 다른 엔드 시스템(도시하지 않음)과 결합된다. -End system 200 is coupled with another end system (not shown) via a network (220). 적어도 하나의 네트워크 중간 장치(도시하지 않음)는 2개의 엔드 시스템 사이에 논리적으로 배치된다. At least one network intermediary device (not shown) is logically arranged between the two end systems. 엔드 시스템은 사용자 인터페이스(202)를 통해 멀티미디어 정보를 렌더링하는 렌더러(216), 및 아날로그 멀티미디어 정보를 디지털화하는 디지타이저(218)를 포함한다. -End system comprises a digitizer 218 which digitizes the renderer 216, and an analog multimedia information to render the multimedia information through the user interface 202. The 멀티미디어 코덱(204)은 디지타이저(218)로부터 디지털화된 멀티미디어 데이터 뿐만 아니라, 또 다른 엔드 시스템으로부터 네트워크(220) 및 RTP 모듈(208)을 통해 수신된 멀티미디어 데이터를 수신한다. Multimedia codec 204 receives the multimedia data received through the network 220 and the RTP module 208 as well as the digitized multimedia data from the digitizer 218, and from the other end. 또한, 멀티미디어 코덱(204)은 RTP 모듈(208) 및 네트워크(220)를 통해 멀티미디어 데이터를 다른 엔드 시스템으로 송신한다. In addition, the multimedia codec 204 also sends multimedia data to the other-end systems through the RTP module 208 and the network 220. 네트워크 전송층 모듈(222)은 마킹/마크 트래킹 모듈(224)을 포함하며, 송신용 엔드 시스템에서는 인출 IP 패킷을 ECT로서 마킹하고 수신용 엔드 시스템에서는 인입 IP 패킷에서 검출된 ECN 마크를 트래킹하여 그들을 마크 피드백 코덱(212)으로 보낸다. A network transport layer module 222 marking / mark includes a tracking module 224, an ECT to fetch the IP packet in the transmitting end system marking and be in the receiving end system by tracking the ECN marks detected in incoming IP packets them and it sends the mark feedback codec 212. RTCP 모듈(210)은 ECT 패킷을 디코드하며, 송신용 엔드 시스템으로 다시 송신하기 위해 혼잡 레포트를 인코드하는 마크 피드백 코덱(212)을 포함한다. RTCP module 210 decodes the ECT packet, and includes the mark feedback codec 212 to encode a congestion report for transmission back to the transmitting end system. 마크 피드백 코덱(212)에 의해 디코드된 마킹 정보는 WTP 모듈에 의해 수신되며, 이는 마킹 정보에 기초하여 가용 대역폭을 추정한다. The marking information decoded by the mark feedback codec 212 is received by the WTP module, which estimates the available bandwidth based on the marking information. 추정된 가용 대역폭의 값은 미디어 컨트롤러까지 전달되며, 이는 가용 대역폭 추정 및 다른 발견법에 기초한 네트워크 데이터 로드를 변경하기 위해 미디어 지정 액션을 취한다. Value of the estimated available bandwidth is transmitted to the media controller, which takes media specify actions to change the network data load based on the available bandwidth estimate and other heuristics. 도시된 실시예에서, 미디어 컨트롤러는 멀티미디어 코덱(204)을 통해 송신 레이트를 조정하고 디지타이저(218)를 통해 디지타이저 성능을 조정하여 송신 레이트를 추정된 가용 대역폭과 관련시킬 수 있다. In the illustrated embodiment, the media controller can relate to the available bandwidth estimate the transmission rate by adjusting the transmission rate, and adjust the performance of the digitizer via the digitizer 218 through the multimedia codec 204. 미디어 컨트롤러는 송신 레이트를 조정하기 위해 여러가지 방법을 이용할 수 있다. The media controller may utilize several methods to adjust the transmission rate. 예를 들면, 일 실시예에서, 코덱은 양자화 레벨을 직접 변경하여 품질을 조정함으로써 송신 레이트를 변경한다. For example, in one embodiment, the codec changes the transmission rate by controlling the quality by manually changing the quantization levels. 다른 실시예에서, 몇몇 형태의 계층화된 코딩이 사용되면, 미디어 컨트롤러는 층을 가감하여 송신 레이트를 변경할 수 있다. If in other embodiments, using some form of layered coding, the media controller may change the transmission rate by the acceleration layer. 다른 실시예에서, 송신 레이트의 빈번한 변경을 피하기 위해, 일단 가용 대역폭 추정이 이전 추정과 충분히 상이하면 미디어 컨트롤러는 단지 송신 레이트를 변경하기로 결정할 수 있다. If in other embodiments, to avoid frequent changes to transmission rate, once the available bandwidth estimate is sufficiently different from the previously estimated media controller it may only decide to change the transmission rate. 도 3은 본 발명의 실시예에 있어서 예시적인 중간 장치를 도시한다. Figure 3 illustrates an exemplary intermediary device in an embodiment of the present invention. 라우터와 같은 중간 장치는 일반적으로 인입 ECT 패킷을 수신하고, 적합하다면 그것들을 마킹하여 목적지 시스템으로 보낸다. If an intermediate device such as a router, typically receives an incoming ECT packets, and sends them to a destination suited to the marking system. 중간 장치는 또한 네트워크 혼잡이 패킷을 보증한다면 패킷을 누락시킬 수도 있다. Intermediate device may also be omitted if the packet is a packet network congestion warranty. 중간 장치(300)는 메모리의 큐와 같은 물리적 패킷 큐(302)를 포함한다. The intermediate device 300 includes a physical packet queue 302, such as a queue in memory. 인입 패킷(308)은 물리적 패킷 큐(302)에서 수신된다. The incoming packet 308 is received at the physical packet queue 302. 중간 장치(300)는 또한 패킷 마킹 가상 큐(304)를 포함하며, 이는 물리적 패킷 큐(302)의 인입 패킷들을 트래킹한다. The intermediate device 300 also includes a packet marking virtual queue 304, which is tracking the incoming packets in the physical packet queue 302. 가상 큐(304)에 있는 패킷(310)의 수가 프리셋 혼잡 임계값(312)을 초과하면, 패킷 관리 모듈(306)은 임계값(312)의 초과시 수신되는 패킷들을 목적지 시스템으로 보내기 전에 마킹한다. If the number of packets 310 in the virtual queue 304 exceeds a preset congestion threshold 312, a packet management module 306 marks before sending the packets that are received in excess of the threshold 312 to the destination system. 또한 다른 마킹 알고리즘이 본 발명의 범위 내에서 신호 초기 혼잡에 사용될 수 있음을 이해해야 한다. In addition, it should be understood that other marking algorithms may be employed to signal incipient congestion within the scope of the invention. 도 4는 본 발명의 실시예에 있어서 각종 장치들 사이의 메시징 및 동작을 도시한다. 4 illustrates messaging and operations among various devices in an embodiment of the present invention. 메시징은 송신용 엔드 시스템, 중간 장치, 및 수신용 엔드 시스템을 포함하는 시스템을 통해 통신하는 것으로서 도 4에 도시된다. Messaging as to communicate over a system comprising a transmitting end system, an intermediate device, and the receiving end system is shown in FIG. 중간 장치는 예를 들면 라우터, 게이트웨이 등의 함께 결합된 다수의 중간 장치를 나타낼 수 있음을 이해해야 한다. The intermediate apparatus to be understood that for instance can represent a plurality of intermediate devices coupled together, including routers, gateways. 주어진 RTC 세션(420)에서, ECT 표시 동작(400)은 송신용 엔드 시스템이 ECT 장치임을 하나 이상의 수신기에 광고한다. In a given RTC session (420), ECT indication operation 400 advertises to one or more receivers that the transmitting end system ECT device. 이는 상기한 바와 같이 초기 개시 동안 ECT 플래그를 설정함으로써 행해진다. This is done by setting the ECT flag during initial start-up, as described above. 수신용 엔드 시스템의 ECT 수신 동작(402)은 송신용 엔드 시스템으로부터 ECT 광고를 수신하고 ECT 표시 동작(404)에서 수신용 엔드 시스템이 ECT 장치임을 송신용 엔드 시스템에 통지하도록 응답한다. Can ECT receiving operation 402 in the receiving end system receives the ECT advertisement from the transmitting end system and responds to notify the transmitting end system that the receiving end system in the ECT unit ECT indication operation 404. 이 통지는 ECT 수신 동작(406)에서 송신용 엔드 시스템에 의해 수신된다. This notification is received by the transmitting end system in the ECT receiving operation 406. 상술한 바와 같이, 다른 송신용 엔드 시스템은 초기에 ECT 수신기가 동작(400, 402, 404, 및 406)을 생략함으로써 특정 데이터 흐름에 있다고 가정할 수 있다. , Another transmitting end system as described above, it can be assumed that a particular data flow by an ECT receiver is omitted in the initial operation (400, 402, 404, and 406). 송신용 엔드 시스템이 ECT 수신 동작(406)에서 수신용 엔드 시스템으로부터 이 신호를 수신하면, 송신용 엔드 시스템은 ECT 데이터 흐름이 수신용 엔드 시스템 에 의해 성립되었다고 판정하고 특정 IP 데이터 흐름이 ECT 데이터 흐름임을 이해하기 시작한다. Song When receiving end system receives this signal from the receiving end system in the ECT receiving operation 406, the transmitting end system ECT data flow can be determined that established by the receiving end system and the ECT data flow a particular IP data flow, begin to understand that. 그 후, 송신 동작(408)은 송신된 IP 패킷의 ECN 비트를 (10) 또는 (01)로 설정함으로써 하나 이상의 ECT 패킷을 송신한다. Thereafter, the transmitting operation 408 transmits one or more ECT packets by setting the ECN bits in the IP packet transmission to (10) or (01). 이들 ECT 패킷은 초기 송신 레이트(예를 들면 "리소스 요구"의 타입)로 송신된다. These ECT packets are transmitted at an initial transmission rate (for example, the type of "resource request"). 일 실시예에서, 초기 송신 레이트는 초기 가용 대역폭 추정, 사용자 입력, 및 시스템 구성들 또는 방법들 중 적어도 하나에 기초한다. In one embodiment, the initial transmission rate is based on at least one of the initial available bandwidth estimate, user input, and system configurations or methods. 다른 예시적인 리소스 요구는 전력에 대한 요구(무선 시스템의 경우), 메모리 또는 프로세싱 리소스에 대한 요구 등일 수 있으나 이에 제한되지 않는다. Other exemplary resource demands are required for the power (for wireless systems), or the like, but demand for memory or processing resources are not limited. 예를 들면 관련 오디오 및 비디오와 같이 2개의 RTP 흐름이 있는 경우, 각 흐름의 패킷들은 이와 같이 마킹된다. For example, if there are two RTP flows, such as associated audio and video, packets in each flow it is marked in this way. 몇몇 실시예에서는, RTCP 대역폭 사용은 RTC에 의해 관리될 수 있기 때문에 RTCP 제어 흐름이 "ECN 인식"으로서 마킹되도록 하는 것이 적합하다. In some embodiments, since the RTCP bandwidth usage can be managed by RTC so it is appropriate to the RTCP control flow marked as "ECN aware". 중간 장치는 초기 리소스 혼잡을 검출하면, "혼잡을 경험함(Congestion Experienced)"을 표시하기 위해 ECT 패킷을 마킹하여 그 패킷을 마킹 동작(410)에서 수신용 엔드 시스템으로 보낸다. The intermediate apparatus upon detection of the incipient resource congestion, it sends the packet to mark the ECT packet to indicate the "Do experiences congestion (Congestion Experienced)" to the receiving end system in a marking operation 410. The 수신용 엔드 시스템은 수신 동작(412)에서 마킹된 패킷을 수신한다. The receiving end system receives the marked packet in a receiving operation 412. The 수신용 엔드 시스템은 편집 동작(413)에서 마킹된 패킷 정보로부터 혼잡 레포트를 생성한다. A receiving end system generates a congestion report from the marked packet information in an editing operation (413). 피드백 동작(414)에서, 수신용 엔드 시스템은 혼잡 레포트를 송신용 엔드 시스템에 다시 보낸다. In the feedback operation 414, the receiving end system sends the congestion report back to the transmitting end system. 동작(408, 410, 412)는 피드백 동작(414)이 발생하기 전에 여러번 발생할 수 있다(즉, 다수의 마킹된 패킷으로부터의 정보는 그것이 송신용 엔드 시스템에 송신되기 전에 혼잡 레포트에 포함될 수 있다). May occur several times before the operation (408, 410, 412) is a feedback operation 414 occurs (i.e., information from multiple marked packets is that it can be included in the congestion report before it is transmitted to the transmitting end system) . 이들 동작에서 엔드 시스템들 사이의 ECT 통신의 잠재적인(그리고 가능성 있는) 다양성은 그 데이터 흐름에서 넓은 화살표로 표시된다. Potential (and potential to) the variety of ECT communications between the end systems in these operations is indicated by wide arrows in that data flow. 또한, 각종 실시예에서, 편집 동작(413)은 각 마켓 패킷을 수신할 때 또는 각종 간격을 두고 발생할 수 있다. Further, in various embodiments, the compilation operation 413 may occur with a variety of time intervals or receive a packet, each market. Id_num Id_num DWORD DWORD 혼잡 레포트에 대한 시퀀스 수. Be a sequence for congestion report. 시퀀스 수는 이 SSRC에 대해 송신된 각 혼잡 레포트에 따라 단조 증가한다. Sequence number is monotonically increasing for each congestion report transmitted for the SSRC. 혼잡 레포트는 RR(Receiver Report)이 수신용 엔드 시스템의 목적지 RTC 세션에 의해 생성될 때마다 송신된다. Congestion report is transmitted each time generated by the destination RTC session of a receiving end system (Receiver Report) RR. 이 ECN 증가는 내부 RR-간격의 변화에 대하여 확고하며 고정된 내부 -RR 기간에 구속되지 않기 때문에, 증가하는 대역폭 가용성의 빠른 보고를 보장한다. The ECN increases firmly against the changes in the internal RR- interval and guarantees because they are not bound by a fixed internal -RR period, faster reporting of bandwidth availability increases. 다른 실시예에서, 필드 Marks, Id_num, Proto, 및 Destport는 삭제될 수 있으며, RTCP 수신기 레포트에 대해 16 바이트의 현실적인 오버헤드를 산출한다. In other embodiments, the fields Marks, may be removed Id_num, Proto, and Destport calculates a realistic overhead of 16 bytes for RTCP Receiver Report. 수신 동작(416)은 혼잡 레포트를 수신하고, 혼잡 레포트를 (마크 피드백 코덱에서) 디코드하여, WTP(weight-per-mark) 모듈에 수신된 정보를 보내는데, 이는 대역폭 추정량이다. Receiving operation 416 receives the congestion report, and decodes the congestion report (in a mark feedback codec), to send the received information to the WTP (weight-per-mark) module, which is a bandwidth estimator. WTP 모듈은 초기 추정, 혼잡 레포트에 보고된 조건, 및 각종 다른 접속 파라미터에 기초하여 새로운 가용 대역폭 추정을 추정 동작(417)에서 산출한다. WTP module computes in the conditions, and various other connection parameters based on the new available bandwidth estimate the estimation operation (417) described in the initial estimate, a congestion report. 이 새로운 가용 대역폭 추정은 관련된 SSRC에 대한 미디어 컨트롤러 모듈에 보고되며, 이는 미디어 지정 액션을 취하여 새로운 가용 대역폭 추정 및 다른 접근법에 기초하여 리소스 요구를 (변경된 송신 레이트의 형태로) 변경한다. This new available bandwidth estimate is reported to a media controller module for the associated SSRC, which takes the media to specify actions based on the new available bandwidth estimate and other approaches to change the resource demand (in the form of an altered transmission rate). 비록 여기서는 송신용 엔드 시스템에 의해 산출되는 것으로 기재되지만, 다른 실시예에서는 새로운 가용 대역폭 추정 및 새로운 리소스 요구가 수신용 엔드 시스템, 중간 장치, 또는 별도의 중재기나 혼잡 관리자에 의해 산출될 수 있다. Even in this case, but described as being calculated by the transmitting end system, in other embodiments it may be produced by the new available bandwidth estimate and the new resource demand can receiving end system, an intermediate device, or a separate arbitration group or congestion manager. WTP 모듈은 혼잡 레포트에 따라 새로운 가용 대역폭 추정을 결정하기 위해 WTP 알고리즘을 구현한다. WTP WTP module implements an algorithm to determine the new available bandwidth estimation in accordance with the congestion report. 송신용 엔드 시스템(예를 들면, 트래픽 소스 또는 송신기)은 n번째 측정 시간 간격 동안 고정된 평균 x n 을 갖는 레이트로 ECT 패킷을 송신하며. The transmitting end system (e.g., a traffic source or transmitter) transmits ECT packets at a rate having a fixed average x n for the n th measured time interval. 여기서 측정 시간 간격의 길이는 MTI이다. The length of the measurement time interval is MTI. 수신용 엔드 시스템(예를 들면, 트래픽 목적지 또는 수신기)은 마킹된 패킷의 수 m n 및 그 간격 동안 송신된 패킷 s n 의 수 모두를 송신기로 피드백한다. A receiving-end system (e.g., a traffic destination or receiver) is fed back to both the number of transmission for a number of m and n the distance of the marked packet packets s n to the transmitter. 혼잡 레포트 정보로부터 도출될 수 있는 이 두개의 비는 대응하는 마크 확률 추정(p n )을 나타낸다. The two non-that can be derived from the congestion report information, represents the corresponding mark probability estimate (p n) to. 일 실시예에서, 가상 큐 마킹 알고리즘이 사용된다. In one embodiment, a virtual queue marking algorithm is employed. 리소스의 실제 용량보다 작은 용량을 갖는 가상 큐가 시뮬레이트된다. A virtual queue with capacity smaller than the actual capacity of the resource is simulated. 가상 큐에 대기하고 있는 적어도 B개의 패킷이 있는 임의의 인입 패킷이 마킹된다. Any incoming packet that has at least B packets waiting in the virtual queue is marked. B의 예시적인 값은 10이지만, 다른 B값도 본 발명의 범위 내에서 고려된다. An exemplary value of B is 10, but it is contemplated within the scope of the invention different B values. 이와 같이 하여, 가중 파라미터는 송신 엔드 시스템에 의해 예상된 가용 대역폭의 가중된 페어 공유를 나타낸다. In this way, the weight parameter represents a weighted fair share of the available bandwidth expected by the transmitting end system. 또한, 가중화 파라미터는 다음과 같다: 이것은 주어진 수(N)의 TCP 접속에 의해 예상되는 레이트를 모방하도록 x target 을 설정함으로써 결정될 수 있다. Further, the weighting parameter is as follows: This may be determined by setting the target x to mimic a rate expected by a given number of TCP connection (N). 3개의 가능한 구성은 후술되며, 여기서 MSS는 IETF RFC 879에서 정의된 바와 같이, TCP에 대한 최대 세그먼트 사이즈를 바이트로 나타내며, 이는 IP 최대 데이터그램 사이즈 마이너스 40이다. Three possible configurations will be described below, where MSS are as defined in IETF RFC 879, it represents a maximum segment size for TCP in bytes, which is a size of minus 40 grams up to IP data. 이 MSS 파라미터는 TCP 옵션으로서 설정될 수 있기 때문에, MSS는 송신기와 수신기 사이의 TCP 접속에 대한 MSS와 관련될 수 있다. This MSS parameter because it can be set as a TCP option, MSS can relate to the MSS for a TCP connection between a transmitter and a receiver. MSS의 디폴트값은, TCP 옵션에 설정되어 있지 않다면, 536이다. The default value of MSS is not set in the TCP option is 536. 가중 파라미터는 퍼 어플리케이션(per-application) 또는 퍼 시스템(per-system)에 기초한 방식으로 설정될 수 있다. Weighting parameters may be set in a manner based on the application buffer (per-application) or buffer systems (per-system). 이것은 또한 사용자 입력을 포함하는 다른 연산 파라미터에 의해 영향을 받을 수 있다. This can also be influenced by other operational parameters, including user input. 상기 알고리즘은, 이득 파라미터 k가 하기 2개의 조건을 만족하는 경우, 타겟 레이트의 근처에 있는 국부적으로 안정한 새로운 송신 레이트를 제공한다. The algorithm, to which the gain parameter k when satisfying two conditions, and provides a new transmission rate locally stable in the vicinity of the target rate. 이득 파라미터는 초기 리소스 혼잡의 표시에 기초하여, 중간 장치를 통해 송신용 엔드 시스템에 의한 리소스 요구(예를 들면, 송신 레이트)의 조정 크기에 영향을 준다. Gain parameter based on the indication of incipient resource congestion, via the intermediate apparatus, the resource request by the transmitting end system affects the adjustment of the size (for example, transmission rate). 더 작은 송신 레이트에 대하여, 상기 식에 의해 리턴되는 x n+1 의 최대값 및 소정의 최소 레이트를 취함으로써 보다 새로운 송신 레이트가 달성될 수 있다. With respect to the smaller transmission rate, a new transmission rate than by taking the maximum value and a predetermined minimum rate of x n + 1 is returned by the above formula can be achieved. 이 제한은 양이 아닌(non-positive) 새로운 송신 레이트의 리턴을 방해한다. This limitation hinders the (non-positive) returns the new transmission rate, not the amount. 도 5는 본 발명의 실시예에 있어서 데이터 스트리밍 환경의 리액티브 대역폭 제어에 대한 동작을 도시한다. Figure 5 illustrates the behavior for reactive bandwidth control of the data streaming environment in an embodiment of the present invention. 관계 동작(500)은 송신용 엔드 시스템과 수신용 엔드 시스템 사이의 ECT 관계를 성립한다. Relationship operation 500 establishes the ECT relationship between a transmitting end system and a receiving end system. 다른 실시예에서, 이 관계 동작(500)은 완전히 생략될 수 있으며 송신용 엔드 시스템은 단지 ECT 수신용 엔드 시스템이 전송을 수신하고 임의의 초기 혼잡 발행을 다시 보고할 것이라고 추측한다. In another embodiment, this relationship assumes the operation 500 can be omitted entirely, and that the transmitting end system is only able to ECT receiving end system will receive the transmission and report back any incipient congestion issues. 가중 파라미터 결정 동작(502)은 가중 파라미터를 결정한다. Weight parameter determination operation 502 determines a weight parameter. 도 6은 본 발명의 실시예에서 이득 파라미터를 설정하는 동작을 도시한다. Figure 6 shows the operations for setting a gain parameter in an embodiment of the present invention. 산출 동작(608)은 혼잡 레포트의 수신에 응답하여 새로운 이득 팩터를 산출하기 위해 다수의 입력을 수신한다. Calculation operation 608 receives multiple inputs to compute a new gain factor in response to receipt of a congestion report. 결정 동작(600)은 패킷의 수를 나타내는 마킹 파라미터 B를 결정하며, RTP 패킷은 중간 네트워크 장치의 큐와 만나기를 예상한다. Decision operation 600 determines a marking parameter B value, which indicates the number of packets, RTP packets will be estimated cue and the meeting of the intermediate network device. 추정 동작(602)은 RTT를 추정한다(일반적으로 RTT에 대한 초기의 추정이 받아들여진다). Estimation operation 602 estimates the RTT (Typically, this initial estimate for the RTT is accepted). 일 실시예에서, RTT는 수신기, 송신기, 또는 예를 들어 RTCP를 사용하는 제어 채널 지정 수단에 의해 추정된다. In one embodiment, the RTT is estimated by the receiver, a transmitter, or for example, the control channel specifying means for using the RTCP. 다른 실시예에서, RTT 추정은, 예를 들어 지수함수적으로 가중된 이동 평균이 현재 추정을 이전 것과 결합시키는데 사용되는, TCP RTT 추정량에서 사용되는 것과 동일한 기술에 기초할 수 있다. In another embodiment, RTT estimate, for example, may be based on the same technology that is used to estimate the exponential weighted moving average of the current to be used for bonding as previously, in the TCP RTT estimator. 본 발명의 다른 실시예에서는 RTT의 다른 추정 방법이 사용될 수 있다. In another embodiment of the present invention may be used other method estimates the RTT. 에 의해 얻어진다. To be obtained. 도 7은 본 발명의 실시예에서 송신 레이트를 갱신하는 동작을 설명한다. Figure 7 illustrates operations for updating a transmission rate in an embodiment of the present invention. 산출 동작(706 및 708)은 혼잡 레포트의 수신에 응답하여 새로운 리소스 요구를 산출하기 위해 다수의 입력을 수신한다. Calculating operation (706 and 708) receives a plurality of inputs to calculate a new resource demand in response to receipt of a congestion report. 결정 동작(700)은 초기 리소스 요구(예를 들 면 초기 송신 레이트)를 결정한다. Decision operation 700 determines the initial resource demand (the initial transmission rate, if for example). 예를 들면, 송신용 엔드 시스템은 값을 저장하는 메모리 위치를 액세스함으로써 초기 송신 레이트를 결정할 수 있다. For example, the transmitting end system may determine the initial transmission rate by accessing a memory location that stores the value. 에 의해 풀린다. Unlocked by the. 도시된 실시예의 제한 동작(710)에서, 리소스 요구 제한, 즉 x n+1 =Max(x n+1 , x min )이고, 여기서 x min 은 엔드 시스템에 의해 허용되는 현재의 최소 리소스 요구를 나타낸다. In the illustrated embodiment limited operation 710, the resource demand limitation, that is, x n + 1 = Max (x n + 1, x min), where x min represents the current minimum resource requirements of acceptable by end systems . 리턴 동작(712)은 값 x n+1 를 새로운 리소스 요구 결과로서 리턴한다. The return operation 712 returns the value x n + 1 as a new resource demand result. 본 발명을 구현하기 위한 도 8의 예시적인 하드웨어 및 동작 환경은, 프로세싱 유닛(21), 시스템 메모리(22), 및 시스템 메모리를 포함하는 각종 시스템 컴포넌트를 프로세싱 유닛(21)에 동작 결합시키는 시스템 버스(23)를 포함하는, 컴퓨터(20) 형태의 범용 컴퓨팅 장치를 포함한다. An exemplary hardware and operating environment of FIG 8 for implementing the invention, the operation coupled to the processing unit 21, system memory 22, and the processing unit 21 to various system components including the system memory, the system bus for 23 includes a computer 20 in the form of a general purpose computing device, comprising a. 하나 또는 그 이상의 프로세싱 유닛(21)이 존재할 수 있기 때문에, 컴퓨터(20)의 프로세서는 단일 CPU(central-processing unit), 또는 흔히 병렬 프로세싱 환경으로 지칭되는 복수의 프로세싱 유닛을 포함한다. Since the one or more processing units 21 may be present, the processor of computer 20 comprises a plurality of processing units, it referred to as a single CPU (central-processing unit), or common parallel processing environment. 컴퓨터(20)는 종래의 컴퓨터, 분산 컴퓨터, 또는 다른 종류의 컴퓨터일 수 있으나, 본 발명은 이에 제한되지 않는다. Computer 20 may be a conventional computer, a distributed computer, or any other type of computer, but the present invention is not limited to this. 시스템 버스(23)는 메모리 버스 또는 메모리 컨트롤러, 주변회로 버스, 및 임의의 각종 버스 아키텍쳐를 사용하는 로컬 버스를 포함한 여러 종류의 버스 구조 중 어느 것일 수 있다. The system bus 23 may be any of several types of bus structures, including a local bus using a memory bus or memory controller, a peripheral bus circuit, and any of a variety of bus architectures. 시스템 메모리는 또한 간단히 메모리라 칭해질 수 있고, ROM(24) 및 RAM(25)을 포함한다. System memory also may be referred to simply referred to memory, including a ROM (24) and RAM (25). BIOS(basic input/output system : 26)은 기동시와 같이, 컴퓨터(20) 내의 소자들 사이에서 정보를 전송하도록 돕는 기본적인 루틴을 포함하며, ROM(24)에 저장된다. BIOS (basic input / output system: 26) is such as during start-up, comprising the basic routines that help to transfer information between elements within the computer 20, and stored in the ROM (24). 컴퓨터(20)는 도시되지 않는 하드 디스크에 대한 판독 및 기입용의 하드 디스크 드라이브(27), 제거 가능 자기 디스크(29)에 대한 판독 및 기록용의 자기 디스크 드라이브(28), 및 CD-ROM 또는 다른 광매체와 같은 제거 가능 광 디스크(31)에 대한 판독 및 기입용의 광디스크 드라이브(30)를 더 포함한다. Computer 20 includes a hard disk drive for reading from and writing to a hard disk 27 that is not shown, a removable magnetic magnetic disk drive for reading from and writing to the disk 29 (28), and a CD-ROM or an optical disk drive 30 for reading from and writing to a removable optical disk 31 such as other optical media further included. 하드 디스크 드라이브(27), 자기 디스크 드라이브(28), 및 광디스크 드라이브(30)는 하드 디스크 드라이브 인터페이스(32), 자기 디스크 드라이브 인터페이스(33), 및 광디스크 드라이브 인터페이스(34)에 의해 시스템 버스(23)에 각각 접속된다. The hard disk drive 27, magnetic disk drive 28, and optical disk drive 30 includes a system bus (23 by a hard disk drive interface 32, magnetic disk drive interface 33, and an optical disk drive interface 34 ) it is connected to. 드라이브 및 그와 관련된 컴퓨터 판독가능 매체는 컴퓨터 판독가능 명령, 데이터 구조, 프로그램 모듈 및 컴퓨터(20)에 대한 다른 데이터의 불휘발성 저장을 제공한다. Computer program associated with the drive and the medium provides a non-volatile storage of the other data for the computer-readable instructions, data structures, program modules and the computer 20. 당업자들은 자기 카세트, 플래시 메모리 카드, DVD, 베르노울리 카트리지, RAM, ROM, 등과 같이 컴퓨터에 의해 액세스 가능한 데이터를 저장할 수 있는 임의 형태의 컴퓨터 판독가능한 매체가 예시적인 동작 환경에서 사용될 수 있음을 이해해야 한다. Those skilled in the art should understand may be used in magnetic cassettes, flash memory cards, DVD, suberic no sound cartridge, RAM, ROM, of any form of computer readable media that can store data accessible by a computer, such as the exemplary operating environment do. 다수의 프로그램 모듈은 하드 디스크, 자기 디스크(29), 광디스크(31), ROM(24), 또는 RAM(25) 상에 저장될 수 있으며, 오퍼레이팅 시스템(35), 하나 이상의 어플리케이션 프로그램(36), 다른 프로그램 모듈(37), 및 프로그램 데이터(38)를 포함한다. A number of program modules may be stored on the hard disk, magnetic disk 29, optical disk (31), ROM (24), or may be stored in the RAM (25), an operating system 35, one or more application programs 36, include other program modules 37 and program data 38. 사용자는 커맨드 및 정보를 키보드(40) 및 포인팅 장치(42)와 같은 입력 장치를 통해 퍼스널 컴퓨터(20)에 입력할 수 있다. The user can via an input device, such as a command information and a keyboard 40 and pointing device 42 to input to the personal computer 20. 다른 입력 장치(도시하지 않음)는 마이크로폰, 조이스틱, 게임 패드, 위성 접시, 스캐너 등을 포함할 수 있다. Other input devices (not shown) may include a microphone, joystick, game pad, satellite dish, scanner, or the like. 이들 및 다른 입력 장치들은 종종 시스템 버스에 접속되는 직렬 포트 인터페이스(46)를 통해 프로세싱 유닛(21)에 접속되지만, 병렬 포트, 게임 포트, 또는 USB와 같은 다른 인터페이스에 의해 접속될 수 있다. These and other input devices are often subject to through a serial port interface 46 that is connected to the system bus connected to the processing unit 21, connected by other interfaces, such as a parallel port, game port, or USB. 모니터(47) 또는 다른 형태의 디스플레이 장치는 또한 비디오 어댑터(48)와 같은 인터페이스를 통해 시스템 버스(23)에 접속된다. A monitor 47 or other type of display device is also connected to the system bus 23 via an interface, such as a video adapter 48. 모이터 외에, 컴퓨터는 일반적으로 스피커 및 프린터와 같 은 주변 출력 장치(도시하지 않음)를 포함한다. In addition to base data, the computer typically includes a peripheral output devices (not shown) such as speakers and printers. 컴퓨터(20)는 원격 컴퓨터(49)와 같은 하나 이상의 원격 컴퓨터에 대한 논리 접속을 사용하는 네트워크 환경에서 동작할 수 있다. Computer 20 may operate in a networked environment using logical connections to one or more remote computers, such as remote computer (49). 이들 논리 접속은 컴퓨터(20) 또는 그 일부에 결합된 통신 장치에 의해 실현되나, 본 발명은 특정 유형의 통신 장치에 제한되지 않는다. These logical connections are achieved, but by a communication device coupled to the computer 20, or portions thereof, the invention is not limited to a particular type of communications device. 원격 컴퓨터(49)는 또 다른 컴퓨터, 서버, 라우터, 네트워크 PC, 클라이언트, 피어 장치 또는 다른 공통 네트워크 노드일 수 있으며, 일반적으로 컴퓨터(20)와 관련하여 상술한 소자들의 대부분 또는 모두를 포함하지만, 도 8에는 단지 메모리 저장 장치(50)만이 도시된다. Remote computer 49 may be another computer, a server, a router, a network PC, a client, a peer device or other common network node, and typically includes many or all of the aforementioned elements relative to the computer 20, but, Figure 8 shows just only a memory storage device 50 is shown. 도 8에 도시된 논리 접속은 LAN(51) 및 WAN(52)을 포함한다. The logical connections shown in Figure 8 comprises a LAN (51) and the WAN (52). 이러한 네트워킹 환경은 모든 유형의 네트워크인, 오피스 네트워크, 기업형 컴퓨터 네트워크, 인트라넷 및 인터넷에 흔히 존재한다. Such networking environments are often present in all types of networks, office networks, enterprise-wide computer networks, intranets and the Internet. LAN 네트워킹 환경에서 사용되는 경우, 컴퓨터(20)는 통신 장치의 일종인 네트워크 인터페이스 또는 어댑터(53)를 통해 로컬 네트워크(51)에 접속된다. When used in a LAN networking environment, the computer 20 is connected to the local network 51 through a network interface or adapter 53, a type of communications device. WAN 네트워킹 환경에서 사용되는 경우, 컴퓨터(20)는 일반적으로 모뎀(54), 일종의 통신 장치, 또는 WAN(52)을 통해 통신을 확립하는 다른 유형의 통신 장치를 포함한다. When used in a WAN networking environment, the computer 20 typically modem 54, including the other type of communications device for establishing communications over a type of communications device, or a WAN (52). 모뎀(54)은 내장 또는 외장될 수 있고, 직렬 포트 인터페이스(46)를 통해 시스템 버스(23)에 접속된다. Modem 54 is connected to the system bus 23 via a built-in or can be external, serial port interface 46. 네트워크 환경에서, 퍼스널 컴퓨터(20)와 관련하여 도시된 프로그램 모듈, 또는 그 부분들은 원격 메모리 저장 장치에 저장될 수 있다. In a networked environment, program modules, or portions thereof, depicted relative to the personal computer 20 may be stored in the remote memory storage device. 도시된 네트워크 접속은 예시적이며 컴퓨터 사이에서 통신 링크를 확립하기 위해 통신 장치 및 다른 수단이 사용될 수 있다. The network connections shown are exemplary and there is a communication device, other means may be used to establish a communication link between computers. 본 발명의 실시예에서, 마크 피드백 코덱, WTP 모듈, 또는 마킹/마크 트래킹 모듈은 오퍼레이팅 시스템(35), 어플리케이션 프로그램(36), 또는 다른 프로그램 모듈(37)의 일부로서 포함될 수 있다. In the preferred embodiment, the mark feedback codec, WTP module, or a marking / mark tracking module may be included as part of the operating system 35, application programs 36, or other program module 37. 가중 파라미터, 리소스 요구값, 혼잡 레포트, 및 패킷은 프로그램 데이터(38)로서 저장될 수 있다. Weight parameter, the resource demand values, congestion reports, and packets may be stored as program data 38. 여기에 기재된 발명의 실시예들은 하나 이상의 컴퓨터 시스템의 논리 단계로서 구현된다. Embodiments of the invention described herein are implemented as logical steps in one or more computer systems. 본 발명의 논리 동작은 (1) 하나 이상의 컴퓨터 시스템에서 실행하는 프로세서 구현 단계의 시퀀스로서 (2) 하나 이상의 컴퓨터 시스템 내에서 내부 접속된 기계 모듈로서 구현된다. Logical operation of the present invention (1) is implemented as a machine module, the internal connection in the implementation as a sequence of processor steps (2) one or more computer systems executing on one or more computer systems. 구현은 발명을 구현하는 컴퓨터 시스템의 성능 요건에 따른 선택의 문제이다. Implementation is a matter of choice according to the performance requirements of the computer system implementing the invention. 따라서, 여기에 기재된 발명의 실시예를 구성하는 논리 동작은 동작, 단계, 오브젝트, 또는 모듈로 다양하게 지칭된다. Accordingly, the logical operations making up the embodiments of the invention described herein are referred to variously as operations, steps, objects, or modules. 상기 명세서, 예 및 데이터는 본 발명의 예시적인 실시예의 구조 및 사용에 대한 완전한 설명을 제공한다. The above specification, examples and data provide a complete description of the structure and use of exemplary embodiments of the present invention. 발명의 많은 실시예들은 발명의 정신 및 범위로부터 벗어나지 않도록 이루어지기 때문에 본 발명은 이하에 첨부된 클레임 내에 있게 된다. Many embodiments of the invention are achieved, since the present invention without departing from the spirit and scope of the invention are within the claims appended below. 본 발명에 의하면, 네트워크를 통한 실시간 통신은 초기 혼잡 조건 하에서 QoS(quality of sercive)를 향상시키기 위해 조정되고, 시스템은 초기 네트워크 혼잡을 검출하여 초기 혼잡에 대한 정보를 송신기로 다시 피드백하며, 이 정보에 기초하여, 가중 파라미터, 이득 파라미터, 및 혼잡 레포트로부터의 정보에 따라 변경된 송신 레이트를 산출하는 제어 알고리즘을 적절히 이용함으로써 송신 레이트가 적절히 변경되기 때문에, 변경된 송신 레이트는 수신기에서 수용 가능한 QoS를 유지하도록 가용 대역폭에 대한 송신기의 사용을 개선시킨다. According to the present invention, real-time communications over a network are adjusted to improve the QoS (quality of sercive) under incipient congestion conditions, the system is again feedback information about the incipient congestion by detecting the initial network congestion to the sender, the information by the weighting parameter, a gain parameter, and by appropriately using a control algorithm which calculates the changed transmission rate according to the information from the congestion report, since the transmission rate is suitably changed, the changed transmission rate based on is to maintain an acceptable QoS at the receiver improve the use of the transmitter to the available bandwidth. 를 포함하는 하나 이상의 컴퓨터 판독가능 기록 매체. One or more computer-readable media including. 상기 리소스 소비자와 관련된 타겟 리소스 요구에 기초하여 상기 가중 파라미터를 결정하는 단계를 포함하는 하나 이상의 컴퓨터 판독가능 기록 매체. One or more computer-readable media including determining the weight parameter based on a target resource demand associated with the resource consumer. 하나 이상의 TCP 접속들 중 소정 횟수의 접속을 통해 예상된 리소스 요구에 기초하여 상기 가중 파라미터를 결정하는 단계를 포함하는 하나 이상의 컴퓨터 판독가능 기록 매체. One or more TCP connections to the one or more computer-readable media including determining the weight parameter based on an expected resource demand over a connection of a predetermined number of times. 혼잡 레포트(congestion report)를 수신하는 단계를 포함하는 하나 이상의 컴퓨터 판독가능 기록 매체. Congestion report (congestion report) one or more computer-readable media comprising the step of receiving. 상기 새로운 리소스 요구를 산출하는 단계는, 상기 이득 파라미터, 상기 가중 파라미터, 상기 초기 리소스 요구, 및 상기 초기 리소스 혼잡의 표시에 기초하여 새로운 리소스 요구를 산출하는 단계를 포함하는 하나 이상의 컴퓨터 판독가능 기록 매체. The step of computing a new resource demand, the gain parameter, the weight parameter, the initial resource demand, and one or more computer-readable media comprising: calculating a new resource demand based on the indication of the incipient resource congestion . 상기 리소스 소비자는 송신단 장치(transmitting end device)를 포함하고, 상기 리소스 요구는 상기 송신단 장치의 송신 레이트(rate)를 나타내는 하나 이상의 컴퓨터 판독가능 기록 매체. The resource consumer device is the transmitting end (transmitting end device) and wherein the resource request may include one or more computer-readable media that indicates a transmission rate (rate) of the sender device. 상기 새로운 리소스 요구는 수신단 장치의 능력에 의존하는 하나 이상의 컴퓨터 판독가능 기록 매체. Wherein the new resource demand is one or more computer-readable media that depends on the capabilities of the receiving terminal device. 상기 컴퓨터 프로세스는 예상된 마크 확률을 결정하는 단계를 더 포함하는 하나 이상의 컴퓨터 판독가능 기록 매체. The computer process further comprising one or more computer-readable media of determining an expected mark probability. 상기 예상된 마크 확률을 결정하는 단계는 상기 초기 리소스 혼잡의 표시에 기초하여 상기 예상된 마크 확률을 추정하는 단계를 포함하는 하나 이상의 컴퓨터 판독가능 기록 매체. Determining the expected mark probability of one or more computer-readable media, including the step of estimating the expected mark probability based on the indication of incipient resource congestion above. 여기서 X target 은 소정의 TCP 접속수(N)에 의해 예상된 전송 레이트이고, P expected 는 예상된 마크 확률인, 하나 이상의 컴퓨터 판독가능 기록 매체. Where X is a predetermined target and the TCP transmission rate estimated by the connection number (N), P is the expected mark probability of one or more computer-readable media expected. 여기서 X n 은 측정 시간 간격 n에서의 리소스 요구이고, k는 상기 이득 파라미터이고, w는 상기 가중 파라미터이고, p n 은 상기 측정 시간 간격 n에서의 마크 확률 추정인, 하나 이상의 컴퓨터 판독가능 기록 매체. 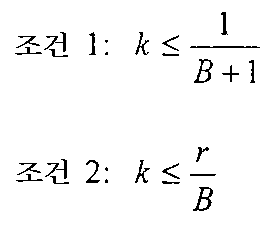 Where X n is the resources required in the measurement time interval n, k is the gain parameter, w is the weighting parameter, p n is the mark probability estimate of the one or more computer-readable media in the measurement time interval n .
제13항에 있어서, 산출된 상기 새로운 리소스 요구가 사전정의된 최소 리소스 요구보다 작을 경우에는 상기 사전정의된 최소 리소스 요구가 상기 새로운 리소스 요구로서 사용되는 하나 이상의 컴퓨터 판독가능 기록 매체. 14. The method of claim 13, wherein the new resource demand is less than a predefined minimum resources required, one or more computer-readable media that is used as a new resource demand is above the predefined minimum resource requirements calculated. 를 포함하는 리소스 요구 조정 방법. Resources required adjustment method that includes. 송신단 장치와 관련된 타겟 리소스 요구에 기초하여 상기 가중 파라미터를 결정하는 단계를 포함하는 리소스 요구 조정 방법. Target resource demand by the resource adjustment request comprises the step of determining the weight parameter based on the related transmitter device. 하나 이상의 TCP 접속들 중 소정 횟수의 접속을 통해 예상된 리소스 요구에 기초하여 상기 가중 파라미터를 결정하는 단계를 포함하는 리소스 요구 조정 방법. Resource adjustment request method comprises of one or more TCP connections based on the resource requirements estimated through a connection of a predetermined number of times determines the weighting parameters. 혼잡 레포트를 수신하는 단계를 포함하는 리소스 요구 조정 방법. Resource demand control method comprising the steps of: receiving a congestion report. 여기서 B는 상기 중간 장치의 큐에서 예상된 패킷들의 개수이고, MTI(Measurement Time Interval)는 초기 리소스 혼잡의 두 개의 연속적인 표시의 수신 사이의 시간의 길이이고, RTT는 왕복 시간인, 리소스 요구 조정 방법. Where B is the number of the expected packet in the queue of the intermediate apparatus, MTI (Measurement Time Interval) with a length of time between two consecutive indications received of the incipient resource congestion, RTT is the round trip time is, resources required adjustment Way. 상기 새로운 리소스 요구를 산출하는 단계는, 상기 이득 파라미터, 상기 가중 파라미터, 상기 초기 리소스 요구, 및 상기 초기 리소스 혼잡의 표시에 기초하여 새로운 리소스 요구를 산출하는 단계를 포함하는 리소스 요구 조정 방법. The step of computing a new resource request, wherein the gain parameter, the weight parameter, the initial resource demand, and the resource adjustment request comprises the step of computing a new resource demand based on the indication of the incipient resource congestion. 상기 리소스 소비자는 송신단 장치를 포함하고, 상기 리소스 요구는 상기 송신단 장치의 송신 레이트를 나타내는 리소스 요구 조정 방법. Wherein the resource consumer includes the transmitting end system and the resource demand represents a transmission rate adjustment method resource request of the transmitting terminal device. 상기 새로운 리소스 요구는 수신단 장치의 능력에 의존하는 리소스 요구 조정 방법. Wherein the new resource demand is how resources required adjustments depending on the capability of the receiving terminal device. 예상된 마크 확률을 결정하는 단계를 더 포함하는 리소스 요구 조정 방법. The method further comprises determining the expected mark probability of resource needs adjustment. 상기 예상된 마크 확률을 결정하는 단계는 상기 초기 리소스 혼잡의 표시에 기초하여 예상된 마크 확률을 추정하는 단계를 포함하는 리소스 요구 조정 방법. Determining the expected mark probability how resources required adjustment comprising the step of estimating the expected mark probability based on the indication of the incipient resource congestion. 리소스 요구 조정 방법. How to adjust resource requirements. 상기 리소스 소비자의 새로운 리소스 요구를 제공하는(applying) 미디어 컨트롤러를 더 포함하는 엔드 시스템. End system further comprises a (applying) the media controller to provide a new resource demand in the resource consumer. 인출 IP 패킷(outgoing IP packets)을 ECN(Explicit Congestion Notification) 가능으로서 마킹하는 마킹 모듈을 더 포함하는 엔드 시스템. Fetch IP packets (IP packets outgoing) the ECN (Explicit Congestion Notification) end further comprising a marking module marking as possible. GB2461244A (en) * 2008-02-29 2009-12-30 Francis P Kelly Network congestion control with feedback to adjust flow rates of source nodes.